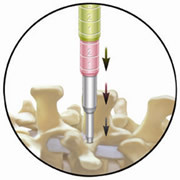 Advancements in diagnostic imaging, surgical techniques, and instrumentation are allowing surgeons to perform surgery of the spine through smaller incisions and with less traumatic approaches than those associated with traditional spinal surgical techniques.Minimally Invasive Spine Surgery (MIS) is also referred to as minimal access spine surgery, endoscopic spine surgery,or laser spine surgery. All of these types of surgeries are called minimally invasive because they are preformed through one or more small incisions through which tubular retractors are inserted. Although not all conditions of the spine should be addressed using minimally invasive methods, for many cases these advances may prove to be of great benefit to patients. As specialists in minimally invasive spine surgerySONSA neurosurgeons utilize the METRx MicroDiscectomy System for a number of spine conditions. The METRx System is composed of bayoneted surgical tools with various-sized metal tubes used to create and maintain openings to spinal elements. Fundamental to this system are specially designed metal tubes, called dilators, which progressively increase in diameter size. These dilators are inserted sequentially—smaller to larger—through the muscle to gradually separate, or split, and open the muscle to create an opening large enough for surgical tools to be used. The system’s retractor tubes maintain the opening while the surgeon uses specially designed surgical tools to reach and remove spinal elements that are causing pain. No muscle fiber is cut, only separated. This unique muscle-splitting approach allows surgeons to access the spine with a posterior approach without cutting or removing muscle from the spine. Disc herniation is the most common condition indicated for surgery with the METRx System. In addition, the METRx System can be used for a laminotomy (partial removal of the vertebra’s thin bony plate), medial facetectomy (removal of a facet joint), foraminotomy (enlarging of a foramina to allow nerve clearance) and nerve root retraction. In terms of relief of symptoms related to unpinching the nerve root, surgical outcomes using the METRx System are comparable to open procedures. However, since the METRx System allows the surgeon to unpinch the root without cutting or stripping muscle, patients are offered several advantages in terms of post-operative pain, recovery period, rehabilitation and cosmetic results.